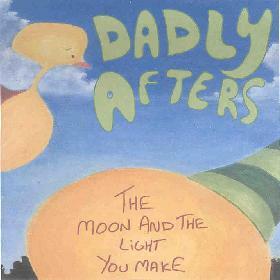 Dadly Afters - "The Moon And The Light You Make"
The packaging and the music are quite minimalistic and odd. It is quite a mixture of stuff with 3 out of ten tracks 1 minute or under and only two tracks over 4 minutes (1 8min). The CD starts with some strange sax noodling. "Unicorns Are Real" is a acid folk song. "Frequency Bird" really reminds me of some of the cool freaked out stuff from the Finnish Fonal record label. I don’t know why but Donovan comes to mind in the way some of the vocals are laid down. "The Yes Takes The Yes" is the 8 minute song and the only one on the CD that really takes you on a sort of strange sonic journey. Pretty cool stuff. Keep it up guys! For more information you can visit the Dadly Afters mp3.com web site at: http://www.mp3.com/dadly_afters.